Century Cycles Blog: Congratulations to our winner of the Electra Townie 7D bicycle from the Great Big Home & Garden Show! Congratulations to our winner of the Electra Townie 7D bicycle from the Great Big Home & Garden Show! Congratulations to Linda Chernitsky! She's the winner of our Electra Townie 7D bicycle! Linda's name was chosen at random from all of the entries we received in our booth at the Great Big Home & Garden Show earlier this month. 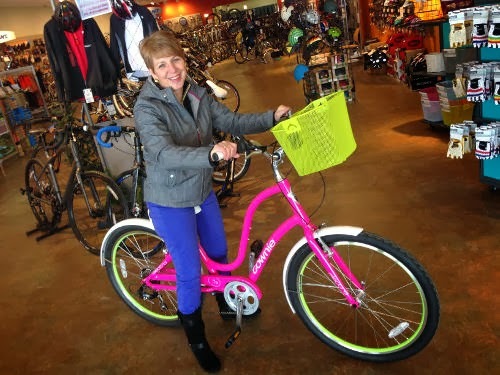 As you can see, Linda chose the Fuchsia (hot pink) Townie, and decided to outfit the bike with white fenders, and a bright green basket to match the bright green rims on the bike! Thank you Linda, and thank you to everyone to visited us at the Great Big Home & Garden Show!